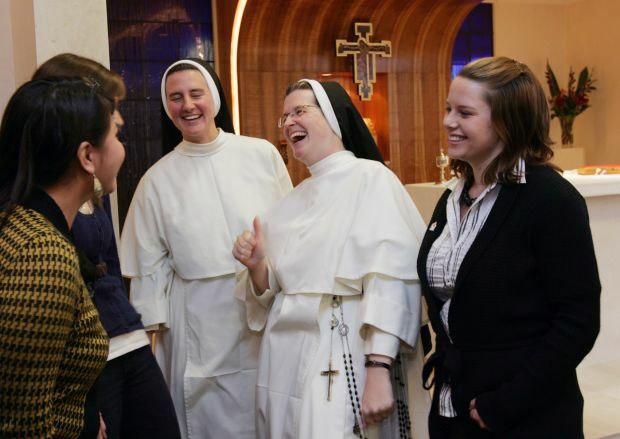 WASHINGTON (CNS) — U.S. women religious welcomed the conciliatory tone of a Vatican report on religious life and appreciated acknowledgement of the important ministry that they practice day in and day out in the life of the church. They also said the report, released Dec. 16, opens a new beginning for women religious, who have continued their work despite the questions about the status of religious life in the U.S. that were raised by the apostolic visitation process that ran from 2009 to 2012. “The positive tone and the clear affirmation found in the document gives us new energy to move on in our critical role for the sake of the mission of the church in the United States,” said Sister Mary Johnson, a member of the Sisters of Notre Dame de Namur who is professor of sociology and religious studies at Trinity Washington University. “I see great good coming out of this in that through the media, the laity and clergy and bishops will now have heightened understanding of our way of life in the church and hopefully will help us respond to the yearnings of women who are interested in religious life,” she told Catholic News Service. Sister Nancy Conway, president of the Congregation of St. Joseph, said she found the report offered “without negative judgment” and called it a “welcome ending” to the visitation. “Look at the use of the verbs in the report: We ask, we invite, we encourage, we urge,” she said from Cleveland. “I perceive this as a great shift in tone, for which I am very grateful. “I’m heartened by the tone. That’s how colleagues work; we recognize each other’s gifts,” Sister Nancy added. Two organizations representing women religious in the U.S. also welcomed the report, both saying that it reflected positively on the different roles their members have assumed in the church. A statement from the Council of Major Superiors of Women Religious cited the words of Pope Francis in saying that the apostolic visitation “offered us a tangible opportunity to ‘feel’ along with the church,” in ministry to others as well as in unity with the magisterium. “The final report acknowledges the fact of the ‘widely diversified expressions of apostolic religious life’ in the United States,” and shows that “apostolic religious life is not dying in the United States,” said the council, which represents about 20 percent of the 51,000 U.S. women religious. The report from the Congregation for Institutes of Consecrated Life and Societies of Apostolic Life did not reference the findings of the doctrinal assessment of LWCR. After that assessment, the Vatican announced in 2012 a major reform of that organization to ensure its fidelity to Catholic teaching in areas including abortion, euthanasia, women’s ordination and homosexuality. The Vatican also appointed Seattle Archbishop J. Peter Sartain to implement the assessment, by providing “review, guidance and approval, where necessary, of the work” of the LCWR. Cardinal Franc Rode, former prefect of the congregation for religious, ordered the visitation in December 2008, saying its aim would be to study the community, prayer and apostolic life of the orders to learn why the number of religious women in the United States had declined so sharply since the 1960s. The visitation involved hundreds of visits with individual religious communities and offered them the opportunity to explain various facets of religious life — including prayer, community, service and ministry. For U.S. religious congregations, the visitation process allowed members to examine prayer life, community life, ministry, vocation recruitment, formation practices and finances. The process, though, also caused many congregations to wonder what prompted the visitation, especially because many felt they were living up to the vision of Vatican II. Sister Barb said the wounded feelings remain. “I believe that we as religious women were willing to face the struggles and the unknown path we were walking. We were and are convinced that through it all we would not be diminished by this time of darkness but would remain credible witnesses of the Gospel,” she said. Sister Mary Angela, vicaress general for the Dominican Sisters of St. Cecilia, said the visitation offered her congregation a chance to learn from others who participated in the visitation process. “People have really gone back to their founders and foundresses. They’ve taken that seriously. They’re looking at what to do to move into the future,” she told CNS. Sister Maria Cimperman is a member of the Religious of the Sacred Heart of Jesus and director of the newly established Center for the Study of Consecrated Life at the Catholic Theological Union in Chicago. She said the report affirms contemporary religious life in all its forms.